I promised myself not to play Facebook games anymore but here I am posting about it, LOL! 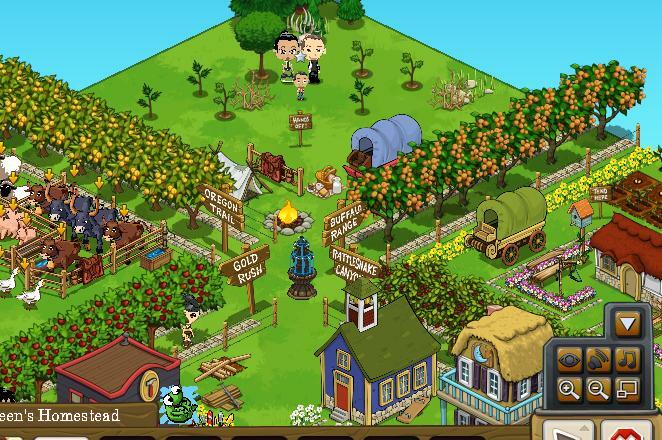 Anyway, I'm playing Zynga's new game on Facebook which is Frontierville. What drew me towards playing Frontierville are the missions I need to complete. The game is based on the goal of improving a homestead. So you are given a piece of forest land and you will have to cultivate it for your homestead to prosper while completing the missions on the side. I also love the energy bar prevents me from staying in the game for so long. I can't do tasks without the energy and it takes 5 minutes for one unit energy to be filled. A week into the game, I encountered the "Thorny Problem" mission that required me to have my "child" remove 5 thorns and 1 cactus from our homestead. The cactus was no problem but the thorn requirement took me another week to complete! You see, I got so excited in improving the landscape of my homestead that I cut up all the trees and installed fences all around it. Major fail. Three days went by but not one thorn grew back. I read some forums and did some tweaking and redesigning and voila! Do you also play computer games like me. I do indulge in computer games once in a while especially when I'm in between writing projects. It gives my brain its much needed break. Try researching and reading about North Carolina health insurance companies for the whole day and you'll understand what I mean, haha!